The Kansas City Royals have won their first World Series title in 30 years after beating the New York Mets 7-2 in game five. The Royals' 12-inning victory over the Mets on Sunday at Citi Field saw them take the best-of-seven series 4-1. It is their first title since 1985 but they had to come from behind to win it, rallying from 2-0 down in the ninth. Eric Hosmer scrambled home to tie the game and they then broke away in the 12th inning. The Royals' triumph came a year after their agonising loss in game seven of last year's World Series to the San Francisco Giants. 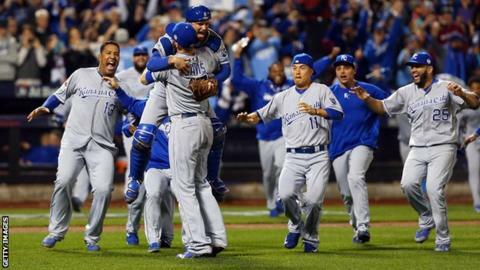 "What they accomplished this year was nothing less than spectacular and very, very special," said Royals manager Ned Yost. "They just don't quit, they've got a lot of heart, they've got a lot of character and they never think they are going to lose." Catcher Salvador Perez was named Most Valuable Player of the series. "It is unbelievable. We feel like a family here and we knew we were going to do something special this year. I felt it in spring training."